A line of Teslas pull up to the taxi stand outside the Amsterdam airport, with a few Mercedes Benz sprinkled in between. 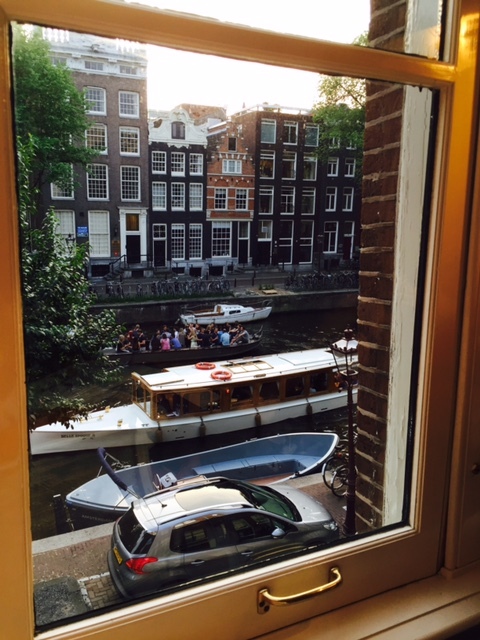 We hopped in a Tesla for a ride to the Ambassade Hotel in Amsterdam, located along the Herengracht canal. 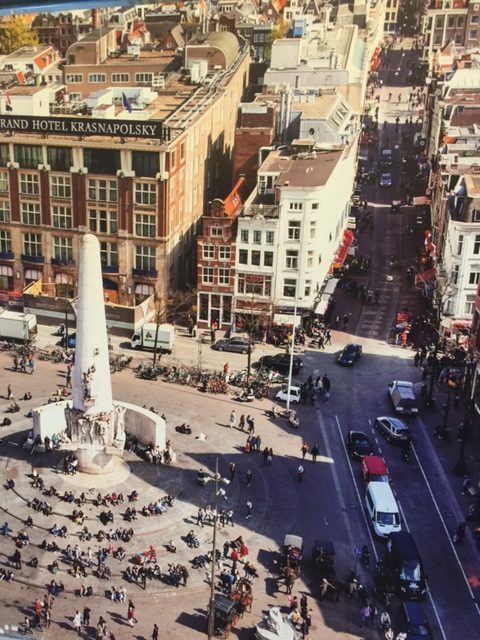 This street is one of the most prestigious in the Netherlands and home to the rich and famous. 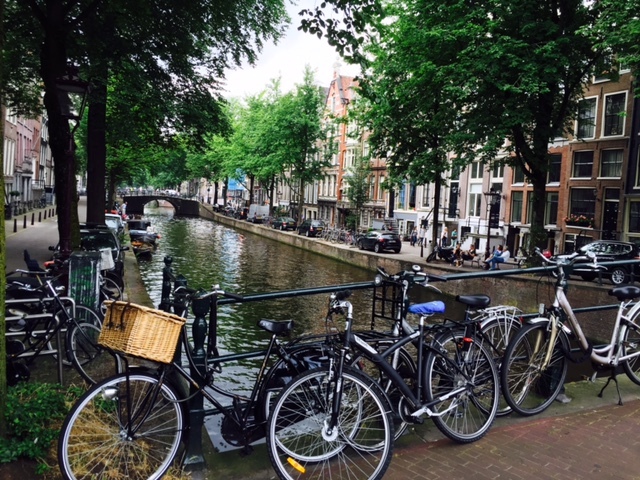 During the 17th century, the wealthiest merchants, mayors and most influential people in Amsterdam had a home on this canal street. 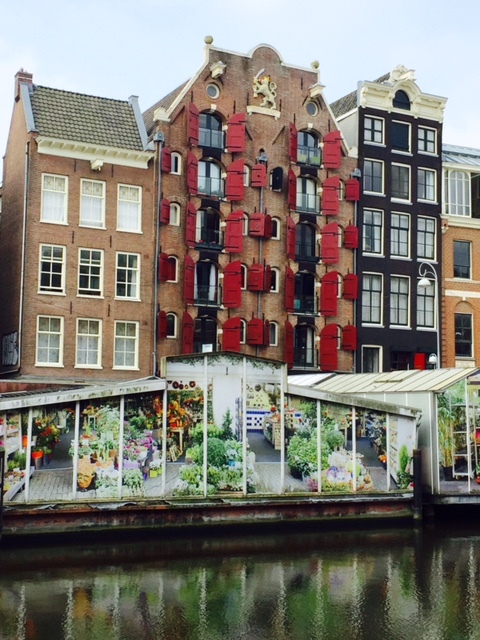 Amsterdam was founded 1275, and the first multi-level home with a beautiful step gable roofline was built in 1590 on Herengracht Street. When John Adams, our second president of the United States, was the first U.S. ambassador to the Dutch Republic, he leased a home, built in 1760 on the nearby Keizersgracht (Emperor’s Canal). 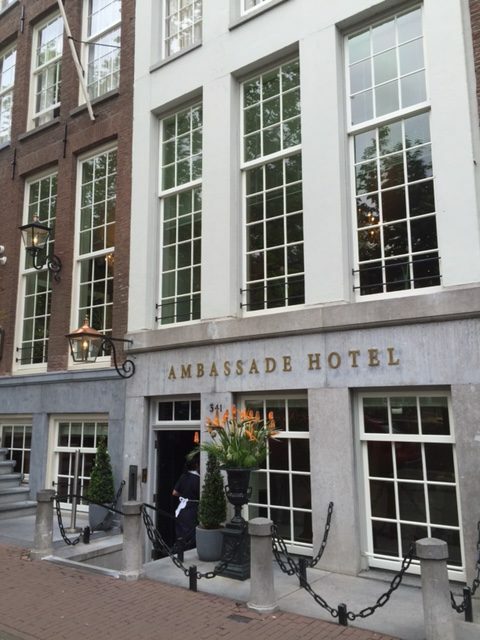 The Ambassade Hotel was once a stately home that turned into a hotel in 1953. Through the years, the hotel has expanded to 59 rooms and suites. It’s a formal property decorated with Danish furniture and artwork. Since 2001, the hotel has displayed a large collection of “Cobra Movement” avant-garde art with many pieces displayed in guest rooms and public areas. In the lobby is the “Cobra Lounge” with a small bar and library offering more than 4,000 signed books written by authors who have stayed at the Ambassade Hotel. The staff is friendly and happy to secure museum tickets and give restaurant recommendations when requested by guests. Walking to our room on the second floor, my husband and I remarked on how the stairs are narrow and steep. Fortunately, there is also an elevator for guests to use. Our canal-view room was decorated in peach and white, with bright orange painted beams and a small crystal chandelier hanging over the bed. As I opened the window to allow fresh air to enter, I noticed an array of small motor boats cruising along the waterway. I could hear the muted chatter of people below, while watching bicyclists pedaling quickly down the one way brick street. Our room had a king-size bed and a single bed for our daughter. There was a sitting room, walk-in closet with plush robes, slippers, a safe and a minibar. The large bathroom had a shower and separate deep soaking tub, ideal after a day exploring museums. 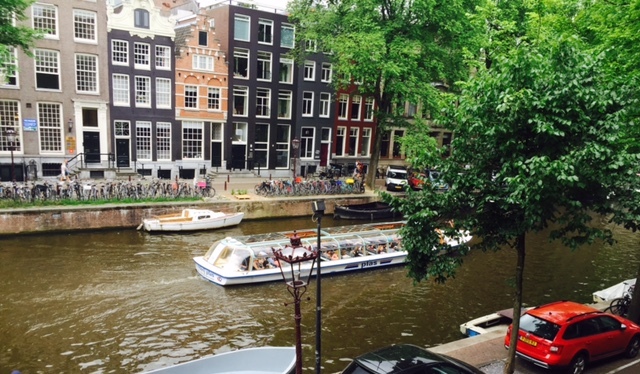 A great way to learn about Amsterdam is by boat. The waterways in the city were created in the 17th century to keep the sea at bay. This was once one of the world’s greatest trade routes at the time. 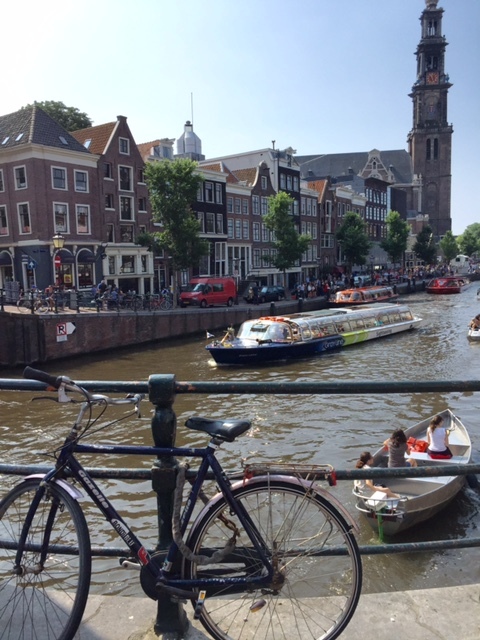 Taking one of the many scenic cruise tours, one learns about the four main center canals: Herengracht, Prinsengracht, Keizersgracht and Singel. In the evening there are candlelight cruises with food and wine. It’s romantic cruising along the water under the bridges lit up with tiny white lights, giving the whole area a magical feel. During the day, visitors can stay onboard or take a hop-on-hop-off cruise. Another way to see the city is by foot or bicycle. There are more bikes than people, with over 800,000 two-wheelers. The residents cycle in the sun, rain, wind and cold. Each day we visited a museum while exploring Amsterdam. 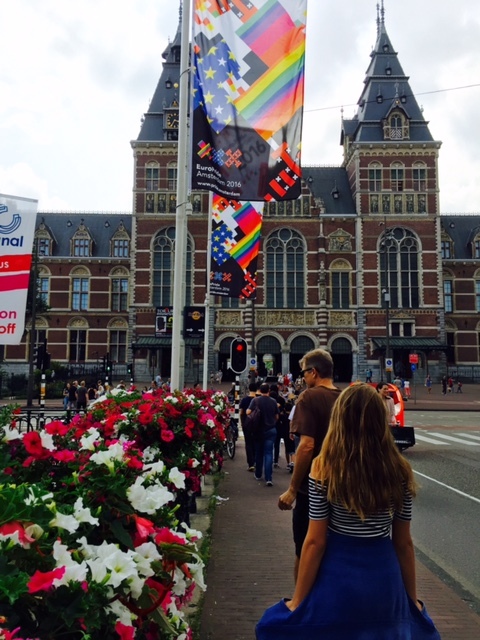 Three of our favorites were the National Museum-Rijksmuseum, the Vincent Van Gogh museum and Anne Frank’s House. The Rijksmueseum is architecturally striking and historic, while the nearby Van Gogh is more modern. It’s one of the most popular museums in the world with 200 of Van Gogh’s paintings, 500 drawings and 700 of his letters. One must also visit the Anne Frank House and learn about the atrocities committed against the Jewish people during World War II. The Prinsengracht House is where diarist Anne Frank and her family, along with a few friends, hid from the Nazis for two years after fleeing persecution in Germany. The front of the house is now a thought-provoking, interactive museum. The back annex has been preserved to give visitors an idea of what life was like for Anne and the other people sharing this small, cramped space. Be sure to reserve a ticket online before you go, otherwise you might have to wait in a long line. Going back to one of the most elite canal streets to our hotel, one can imagine aristocrats walking along the brick streets of “The Venice of the North.” The Dutch are masters at building architecturally picturesque and unique row houses. They are narrow and tall with iconic gables. Since most are built on land below sea level, many have shifted to the left or to the right slightly. Fortunately, the nearby neighboring house helps hold these “dancing houses” up for support.